The Debut is a film about people who once found their passion. 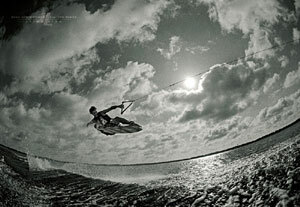 It is a film about people who love wakeboarding. The world's best riders will be followed on their journey all over the world. High-End production techniques will capture their riding, the places they go to and who they really are. What people value most about a wakeboarding video can be different. Some people are strictly interested in great riding by the top pros, others enjoy seeing great editing and a unique video idea, others may like groundbreaking tricks or amateur action. Personally, the type of video that gets me most excited to ride is one that has good riders, beautiful scenery, 16 mm footage, and makes me just wish I was out on the water. Relentless fits in my criteria perfectly. Relentless takes the top riders on their Pro Team on a week long trip to Lake Powell and takes advantage of beautiful scenery and outstanding wakeboarding. There is some footage throughout the movie from Florida and other locations, but the majority of the movie is at Powell. Although it's been done before, the scenery at Powell and the good riding it tends to bring out from pros makes for an inspiring movie to watch. The cinematography in Relentless is top notch. I'm a big fan of 16 mm footage. Combined with the scenery of Powell, the slow motion tricks just look so pure and smooth. It has superior clarity and color to digital that I prefer. Album Films does a great job of filming from multiple angles and getting the right shots. An excellent job. Relentless is definitely not short. Each rider has a lengthy section, and there are quite a few top riders featured. There is also ample bonus footage of more riding. Relentless features the best riding the Liquid Force team has to offer. You definitely won't be disappointed in the tricks they throw down. The sections that stood out to me were Shawn Watson's opening segment, Mike Ennen's section, and Tim Kovacich's wakeskating section. Watson dominates on the water to some relaxed music and great footage. Ennen is a northwest rider like myself, and I've always enjoyed his smooth style so it's great to see him in such a major video. Kovacich has a great wakeskating performance including some insane tricks over various obstacles. Liquid Force Fish Section. All the riders go off on the new Fish board from Liquid Force. Relentless is my favorite video of 2004. The combination of scenery, cinematography, music, and the entire high quality feel make it an inspiring film to watch. No wakeboard video collection would be complete without it. It's as simple as that. very happy with my purchase, its a must have wakeboarding dvd! Justin really out did himself, the editing and the photage is great. great bonus features too...overall its the best wakeboarding video i own! This DVD is amazing, the music, camera work, and locations are amazing. Not like any other wakeboarding DVD. Definitely buy it, its worth it. Since getting it a couple of days ago I have probably watched it some 20 times already. This DVD is amazing, the music, camera work, and locations a ..